My 33rd birthday came and went without much fanfare. I climbed a bunch of fun face routes up on the Zappa Wall in Cochise Stronghold. I decided that I wanted to keep my birthday on the DL. Last year was a little different. January 2010: I was sitting in la cocina at la Posada in Potrero Chico with Matt Hartman and Scott Palmer when I hatched the harebrained scheme of a birthday party at Indian Creek. Obviously I would have to climb 32 pitches. It seemed like such a daunting task. But we (Matt was my social event organizer) sent out emails anyway. I think one of my biggest fears is throwing a party and nobody shows up. It would not have surprised me. So I started telling people about it. If I told people about it, I would have to do it. Soon thereafter I found myself in a snowy Indian Creek February. I was getting some climbing in but the weather was still hit and miss. I had my fingers crossed as I approached the big day. I had a mandated three day rest prior (replete with a hotel room!) 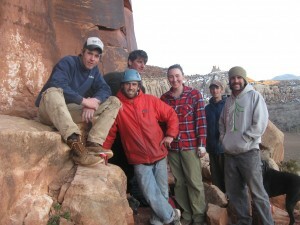 due to a wilderness first responder recertification in Moab. We noticed that the weather looked gloomy on the 7th, so we bumped up the day to the sixth. So it wouldn’t be my birthday, but who cares, it was still going to be climbing. Sydney and I cruised to the creek on the morning of the fifth and did some warm up climbing at the Blue Gramma Wall, me once again, taking a whipper on the namesake…years of frustration. The scene was set as was the venue. A handful of folks showed up. There was Sydney, Emily, Matt, Jake, Doug, and Dustin; Alf and Hienriech joined our crowd later in the day. Matt bought duplexes, Coors Originals and two other rope guns with him. I spent the night of the fifth hydrating. For some reason I was doubting myself. The next morning Jake and I drove to Blue Gramma in the predawn dark, easily dispatching three routes that we had hung ropes on the previous day. We then made quick work of the Split Pillar and headed up to the Donnelly parking lot to meet up with the others. I led a handful of routes over the day, but mostly my team of rope guns hung the lines and I blissfully followed. The Donnelly classics fell easily and eventually we migrated to the Supercrack Buttress. Incredible Hand Crack, The Wave, Keyhole Flakes, and then for number 30 Doug went and hung Coyne Crack. It was still early and I knew it was in the bag, but I needed to finish in good style. So I sent it in good style on TR and then moved to the far right to climb a unnamed hand crack that Sydney had led. By the time I made it back from that there was a large group on the Supercrack. It was decided that I should finish that by leading it. Luckily we still had time and beer. We waited. I think we unintentionally scared them off. The Coors that I shotgunned at the top before down climbing the route was good. A top roping fiesta was had before retiring to Creek Pasture in the desert sunset. It rained the next morning, as predicted. 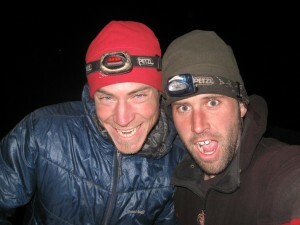 We ate breakfast in Jake’s van, washed down with Miller and Coors then climbed the Cave Route. ‘Twas a good day as well.